One of the most iconic cars Porsche ever produced is probably the Porsche 356 Speedster. Even though the car at first wasn’t exactly a great success, things have changed over the years. From the dispraised low-budget Porsche for students, it turned into one of the most wanted Porsches by many enthusiast. Despite the lack of any comfort, it definitely is a great pleasure to drive the Porsche 356 Speedster, especially when one is living in a warm and dry climate. That’s probably a great expiclation for the success of the model nowadays in California. Steve Heinrichs, member of the Porsche 356 Registry and renowned Porsche connoisseur and collector took the 50th anniversary of the Porsche 356 Speedster, that first saw daylight in 1954, as the occasion to put together the never to be equalled Porsche 356 Speedster meeting. No better place to gather as California of course, and thats what happened. After many months of hard labour, Henrichs and his crew were ready. 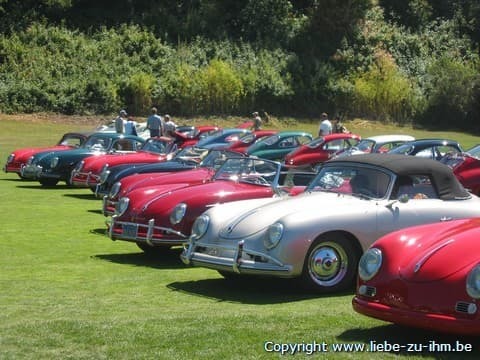 Hundreds of Porsche 356 Speedsters showed up, and even more other Porsche 356’s from all ages and models. Steve’s own collection of Porsche 356 Speedsters was on the meadow too. Oh my, what a collection. Not only the prototype of the Porsche 356 Speedster could be seen, the first Porsche 356 Carrera Speedster too, ad the very first Porsche 356 Speedster that ever raced in the USA. Just to name some of the extra-ordinary Speedster collection in Steve’s possession at the time. This kind of gatherings is stunning. There’s a constant coming and going of cars, you don’t know where to look first, and there’s no way a true Porsche enthusiast could leave the premises without hoping to be part of such a great event again.